0 Comments Published by Cedric Benetti on Thursday, March 18, 2010 at 3/18/2010 01:58:00 PM. Starting March 25th, the Louvre will be displaying its latest comissioned interior artwork of a contemporary artist: The ceiling painting of the Salle des Bronzes (Sully wing on the second floor), done by Virginia-born Cy Twombly. It will be the third work of a living artist ordered by the museum to permanently adorn its illustrous halls. 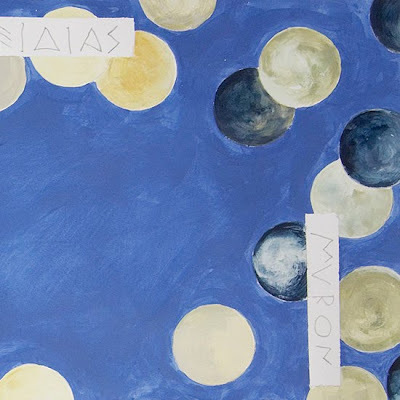 The projected work is an abstract composition on a blue background complementing Georges Braque’s ceiling in the gallery next door, and includes reference names of the most celebrated classical Greek sculptors of the fourth century, reminding a series of paintings executed by the Twombly in the 1960s. Twombly’s work has often been characterized by a continuity between past and present, and this painted decoration is in many ways the culmination of years of artistic exploration.